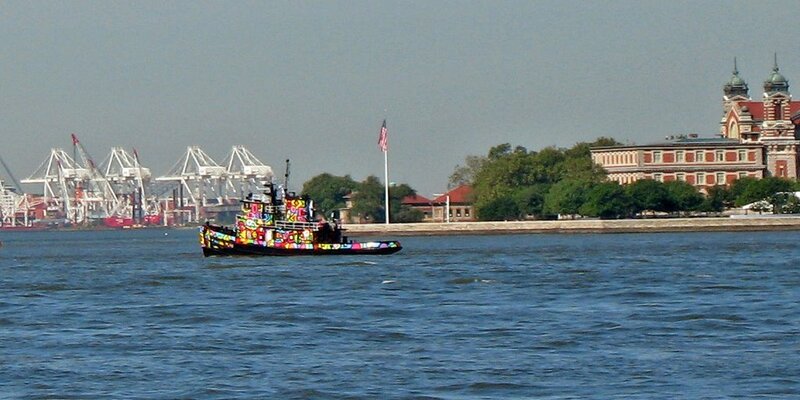 While walking along the Battery Park Esplanade, I saw this unusually decorated tug sailing past Ellis Island. I've been loath to post about the Middle East. I tell myself this is because I'm no expert, but I know it's really because, whatever opinion one may express on the subject, no matter how apparently anodyne, someone is going to find it mightily offensive. Moral cowardice? I prefer to think it's just that my thoughts on the matter, ill-informed as they may be, are - how you say? - nuanced. So I'm glad to find a link in Eric Alterman's MSNBC blog to an essay in, of all places, New York magazine, which I dismissed years ago as lightweight fare for superficial yups - a kind of upscale People - that I think I can recommend almost (Okay, I have problems with the first paragraph. I agree that global warming is a serious problem. I'm not sure that any solution "doesn't look that onerous.") unreservedly. It's by Kurt Andersen, and you can find it here. "He is filled with the insight that none of us has time to to live the true dramas of the life that we are destined for. This is what ages us -- this and nothing else. The wrinkles and creases on our faces are the registrations of the great passions, vices, insights that called on us; but we, the masters, were not at home." Illuminations, (Trans. Harry Zohn, Schocken, 1969), 211-212; quoted in Michael D. Jackson, "In the Footsteps of Walter Benjamin", Harvard Divinity Bulletin, Spring, 2006, at p.44.